By Hugh Jackman...er...I mean Wolverine. X-Men Origins: Wolverine. Starring Hugh Jackman and his biceps. Were all of you worried about me? Were you thinking: Wolverine has been out for a week now and Kasie hasn't posted anything about Hugh on her blog. Maybe she's ill. Maybe we only thought she was disturbingly obsessed with Hugh, but she really isn't. Maybe she won't say a thing about the movie. No need to worry, my friends. I'm just as obsessed as you always thought me to be. I mean, I was talking about this movie four months ago. Saw it. Didn't analyze it. Happy. Pretty sure I'll see it again. Kasie, Did you see him on Oprah last week? OMG!!! One word: Magnificent! I loved that movie. Now my poor husband is spending his time at the gym desparately trying to get the biceps that had me drooling through out the whole movie. I did try to reassure him that I didn't really need biceps like that, I mean, they're so hard and muscular. I think my glazed over eyes may have made my argument a little weak though. That movie was beautiful...in a violent kind of way. I can honestly say he is one of the greatest actors of our time. I saw it and loved it!! Eligh cried the whole way through...bad idea to bring him to see it! 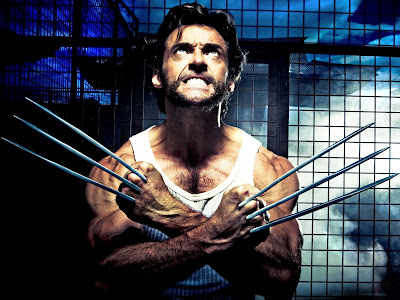 Love the biceps...I mean Wolverine. Lol. I will definitely go see it again, soon!! By the way, I accidently deleted the comment previously, sorry!! So, is your husband trained like mine is? Does he tell you the name of a movie coming on later or does he just say Hugh is on at eight? My husband says John Travolta is on or Johnny Depp at nine. He knows better than to tell me the name of the movie, like, who cares? Can't wait to see it. Saw Star Trek this weekend. I really liked it. He is one very talented man. Have you seen him dance? and sing? Oh man, I want to see this so bad! 'starring Hugh Jackman and his biceps' I'm still laughing. And yet I am seriously in agreement at the same time. I only have one complaint about that movie. It was too short!!! I did not know that we shared the same love...I have loved x-men (wolverine)from day one and this was the best so far. I loved it!! I too wish it was longer! PS Miss you! and your books! Got any new ones for me?